Pro-democracy activists say US not giving them support as they face regular brutal crackdowns and beatings by security forces. US President Barack Obama's rapprochement efforts led the US and Cuba to officially re-launch diplomatic ties on Monday with the opening of a Cuban embassy in Washington, but pro-democracy activists in Cuba say Obama has abandoned them. Berta Soler, leader of a key Cuban opposition group called Las Damas de Blanco (Ladies in White), told Al Jazeera that "we're not seeing the support (from the US - ed.) that we need at such a crucial time." Soler said that her group's protest marches held every Sunday in Havana have been targeted by security forces especially over the last three months, with members of the group arrested and even assaulted by police. She accused Obama of caring more about tapping into the Cuban market than caring about democratic rights. "We don't want to have McDonald's and to have human rights violations," Soler said. "We want that first there is respect for human rights, rights for all Cubans. And then afterwards, let McDonald's come." Las Damas de Blanco was founded in 2003 by Soler and several other women to demand the release of 75 democracy activists, journalists, and even librarians who were thrown in jail earlier that year in a harsh crackdown termed the Black Spring. Since then a splinter group was formed this March, led by Laura Labrada Pollan. Pollan said that with the rapprochement between the US and Cuba, she hoped America "will not abandon the struggle of civil society...because it is fighting to start true democracy in Cuba." Pro-democracy activist Antonio Rodiles is also active with the groups, and reports particularly brutal abuse he suffered on July 5 ahead of a weekly Sunday march. Rodiles said the security forces with "total impunity" threw him into a car and hit him, shattering his nose. "I don't know where we'll end up, because the regime is acting with total freedom to do what it's doing." The testimony of assault and regular arrests to prevent protest backs the criticism of American lawmakers such as Senate Republican leader Mitch McConnell, who described the rapprochement as a “mistake” after it was announced. "Look at Vietnam," McConnell said. "We normalized relations with them and they are a Communist regime that still represses people. Sometimes engagement works, sometimes it doesn't." Abandoning democracy or undermining socialism? While the re-establishment of ties with the repressive Cuban regime has been highly criticized by pro-democracy activists, Obama has also been condemned by pro-regime sources claiming he is trying to undermine the socialist regime. 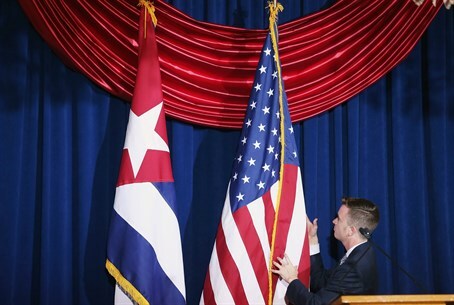 The US State Department in February launched a new Cuba Outreach Initiative program to function from the American embassy in Havana; under the auspices of the program the embassy is to develop contacts with Cubans and hold exchange programs. "The American government sees this as an opportunity," warned Iroel Sanchez, a pro-Cuban government writer and blogger, according to Al Jazeera. The program is one of many programs aimed to strengthen Cuban civil society, which the US plans to spend $20 million in 2016 on to support "fundamental freedoms and respect for human rights" and aid "victims of political repression and their families." However, the Cuban government has called for the US to stop the programs, saying America is interfering in internal matters to Cuba. According to the American government, it has spent over $1 billion since the early 1980s in programs meant to promote democracy in Cuba and increase the freedom of information there.